The High Peak Wilderness First Aid 40hr course has another date added to the calendar as the October course is now fully booked. This expedition first aid training course is modular to enable participants to progress as far as required to satisfy due diligence for expedition companies, those working in hostile environments and companies who send employees who are critical to the day to day operation of a business overseas. An employer may have undertaken a risk assessment and realised that the expedition, company or employee is at risk of an environmental hazard such as earthquake, GLOF, fire, tsunami or tornado. 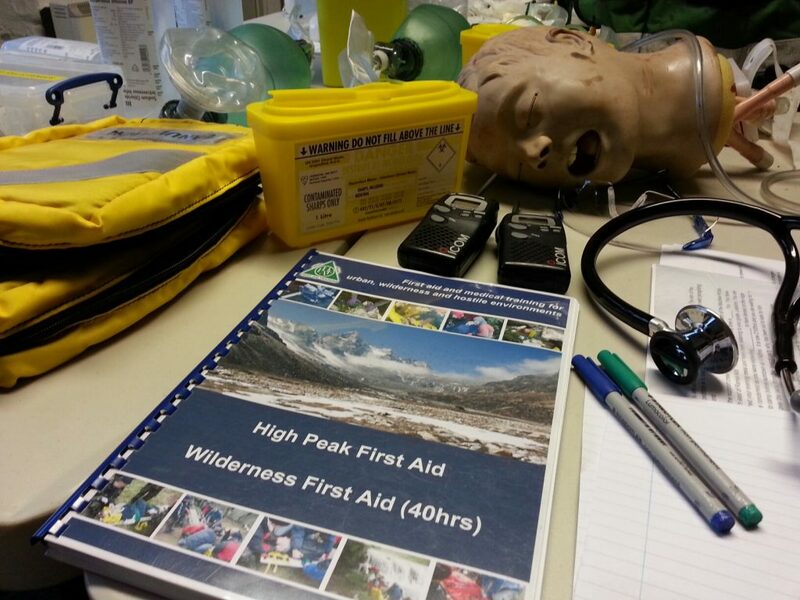 At High Peak First Aid we place an emphasis on active and experiential learning using simulations or scenarios as a tool to ensure that participants are given the skills and confidence to deal with an accident, emergency, disaster or near miss in an urban, remote or hostile environment. If you haven’t the foggiest of the difference between an accident, emergency, disaster or near miss: we can make sure you do after attending the High Peak Wilderness First Aid 40hr course. Heinrich’s accident theory will make sense along with normal accidents…what is normal about an accident you may ask? This first aid course starts with core competencies in basic first aid. The basic skills matter as you will find out when we refer to the trimodal distribution of death and the platinum 10 minutes. As you progress you will be able to manage basic first aid occurrences in your workplace whether that is based in an urban, remote or hostile environment. Regardless of where you work in the United Kingdom you still need to comply with the Health and Safety Executive (HSE) guidelines. Reporting of accidents, COSHH and RIDDOR is common sense after you have attended this course. At High Peak First Aid we are pretty good at sneaking in the legislation that could send you to sleep. We also offer courses for clients overseas who have high standards and although not regulated by the HSE, they know and like to advertise that they adhere to the best possible safety standards. Before you know it legislation will seem like common sense and is a small part of the course. You will spend most of your time interacting with the Tutors who are highly qualified and experienced. We are pretty fussy about who we employ as we expect our Tutors to work hard to impart all of their knowledge for you. As you progress on this course and you become competent at more advanced skills we never forget the basics. The basic skills such as the primary survey, cardio-pulmonary resuscitation and treatment of bleeds are what counts when an accident happens. If you need to know when, why and how haemostatic dressings, Celox and tourniquets are needed, we can tell you, show you and have you practise. You might be working at altitude so need to know how to recognise and treat altitude illness. It’s not all about high altitude mountaineering: you may have a business client and be driving at altitude on the way to a factory. Attend a course with us and you will be able to recognise the symptoms of Acute Mountain Sickness (AMS), High Altitude Pulmonary Oedema (HAPE) and High Altitude Cerebral Oedema (HACE). You will be able to act fast as you will have undertaken a comprehensive risk assessment and be carrying a first aid kit complete with drugs for altitude illness. If you are leading a group overseas and altitude illness strikes you will also know how to use oxygen, a pulse oximeter and an oxygen concentrator. Depending on your place of work or expedition your skills may be needed to aid a medical professional in a remote environment where help is likely to be delayed. We cannot give you a licence to practise but can ensure you have been trained to recognised guidelines and are competent to assist a medical professional. You will be sharing this expedition first aid training with other like minded people who have a desire to advanced their first aid training. We hope you never need to use the skills learnt during first aid training but we know we can give you the skills to feel confident and step forward when it counts. This course is available in the UK for individuals and for groups in Europe, the Middle East and Asia. This entry was posted in Announcement, first aid at work courses, first aid courses, mountain first aid courses, News, Wilderness First Aid. Bookmark the permalink.